Description: This course reviews the trends in outdoor amenity spaces in hospitality, commercial, and multifamily developments with a focus on the use of stainless steel cabinetry in outdoor kitchen design. Included are discussions on outdoor kitchen components, mobile food and beverage service carts, and the post and panel system developed for multifamily applications. Mitchell J. Slater is President for Danver Stainless Outdoor Kitchens & Brown Jordan Outdoor Kitchens, an industry leader in the design and manufacture of stainless steel outdoor kitchen cabinetry. He received his MBA in 1981 with focus on Finance and Operations and has 17 years in stainless fabrication with deep knowledge of the cabinet industry. Mitchell and his staff developed the stainless outdoor modular kitchen into an award winning design, recognized by the Interior Design and Architectural communities. As a recognized Outdoor Industry spokesperson, he is a contributing writer to Casual Living Magazine focusing on the quickly changing trends in design in the Outdoor Living marketplace. 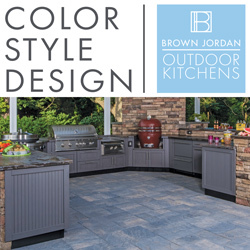 Mitchell possesses the unique ability to balance creativity, product development and sales, creating and developing products for Danver’s and Brown Jordan Outdoor Kitchen’s trade customers and dealers. You need to be logged in to download the course materials for Outdoor Amenity Space Solutions for Hospitality, Commercial, and Multifamily Applications.